After what had seemed an age, though in all probability was little more than 20 minutes, Festus leaned over the transom, and with a gloved hand grabbed the heavy mono leader. Steadily he inched it towards the boat, but still the fish was not ready. Gathering its final reserves of energy it surged away from the boat forcing Festus to release the leaded, again disappeared into the inky blackness. Luckily I had followed the advice shouted down from Angus Paul, the skipper of Neptune, and had eased back the lever drag a touch to release some pressure on the clutch, else the game would certainly have ended there and then. The fish dived deep, very deep, taking with it yard upon yard of line, though gradually it eased to a stop and once again I started working. The night was as black as pitch and we were fishing in total darkness, so I had to estimate in which direction she was now running as, continually listening to the advice offered by the crew. Ten minutes later and once again I could see the eerie glow emitting from the chemical light stick perhaps 30ft below the surface, then once again one of the crew reached out and caught the leader and pulled my still unseen fish to within landing range. As finally the fish surfaced a dart tag was inserted as we had hoped to release it, but as she was drawn into the pool of deck light alongside the boat we could see she was bleeding badly from the gills, so reluctantly the decision was made to land her. Seconds later the gaff went in and it took the combined efforts of the crew to haul her over the gunwale, from where she slammed down onto the deck with a satisfying thump. I had finally caught my first broadbill swordfish! My first Kenyan broadbill, one of three boated from an amazing 11 bites. 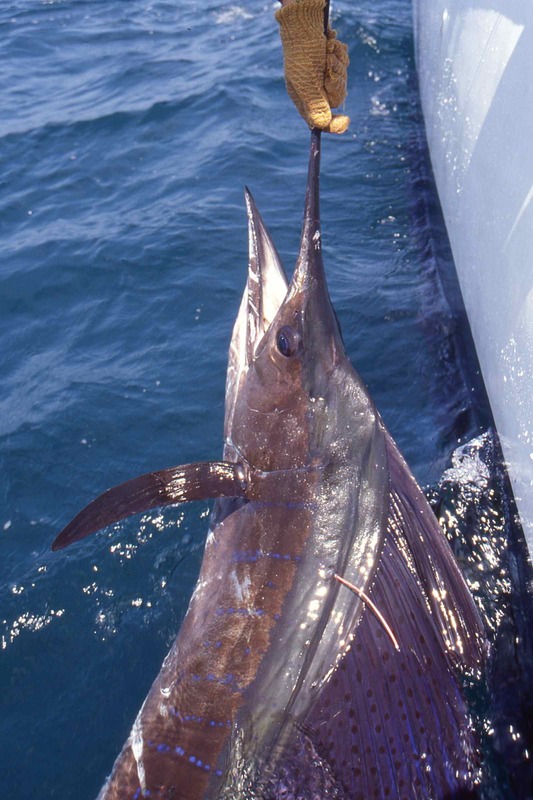 The broadbill swordfish is regarded by big-game sports fishermen worldwide as being the most elusive of the billfish family. Yet of all 9 species of billfish the broadbill has the widest distribution, ranging throughout both tropical and more temperate latitudes. Broadbill are caught throughout North Atlantic, in New Zealand, off the Pacific Coast of both Central and Southern America, in Florida in the Mediterranean, and at numerous other destinations. 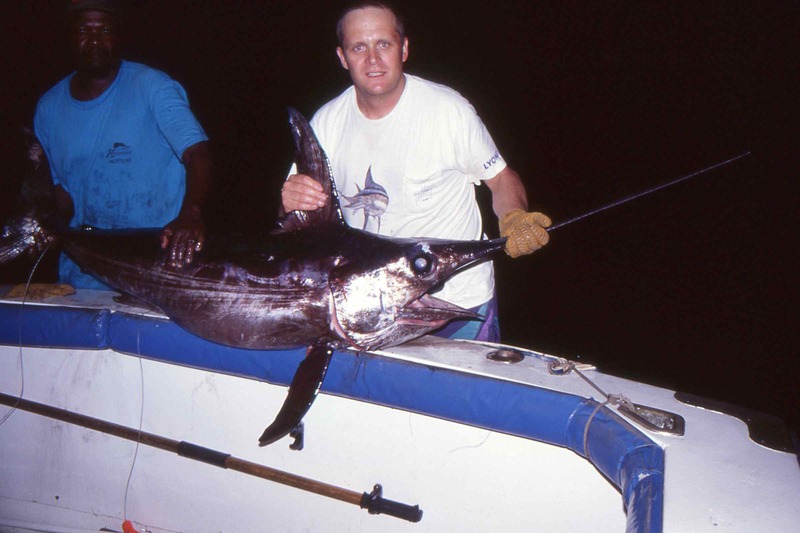 Rarely are broadbill swordfish caught anywhere with any degree of consistency apart from at a few very localised destinations, which include Venezuela, parts of Mexico, South Africa’s Cape Coast and increasingly in recent years off the coast of Florida where the use of newly developed techniques designed for sport fishing for the species during the daytime have been pioneered with great success. 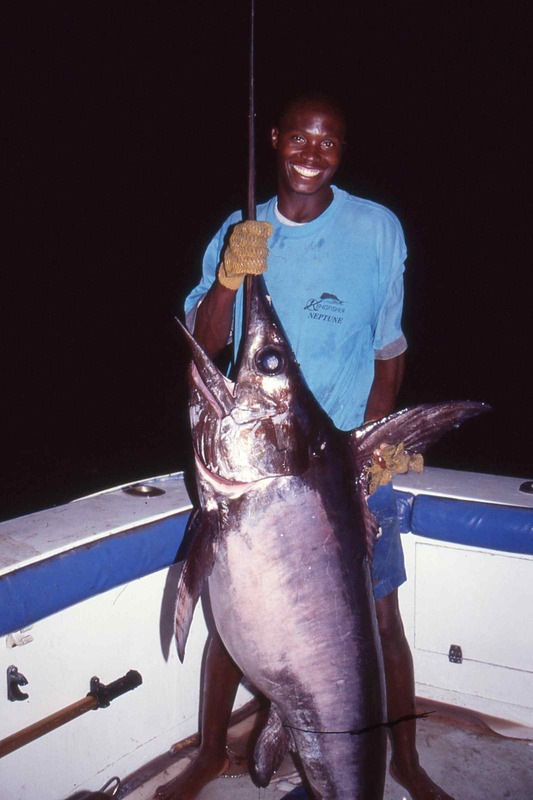 My desire to catch a broadbill started on one of my first trips to Kenya, when I saw one that had been caught from a then recently discovered area located well offshore known as the North Kenya Banks. The NKB lies around 40 miles off the coast of Malindi, and consists of a huge undersea plateau which rises from depths of several thousands of feet to within 600ft of the surface. Here huge volumes of cold, nutrient rich water are forced upwards forming the foundation blocks of the oceanic food chain by creating an area immensely rich in bait. 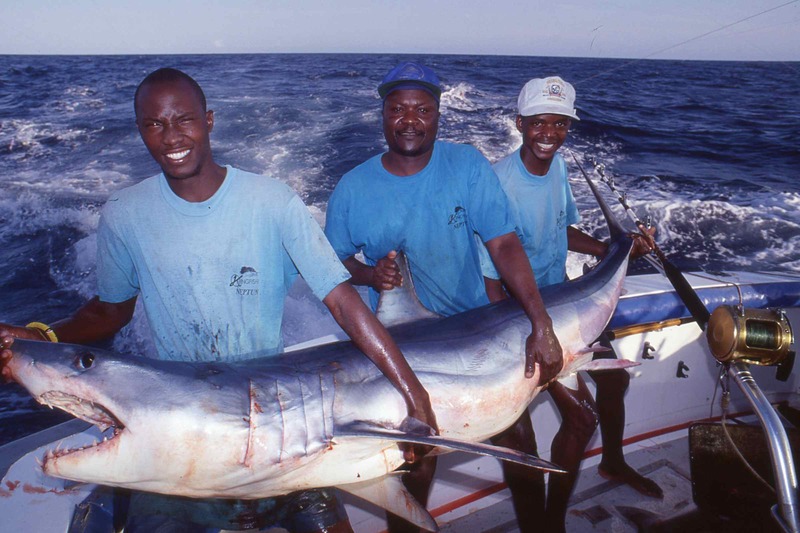 Such a profusion of food invariably pulls in the larger members of the food chain including a lot of sharks, yellowfin tuna, blue, black and striped marlin, sailfish and broadbill swordfish. Boats which fish the NKB fish two full days, plus the night, which is when they target swordfish. When in the early 1990’s this fishery was first discovered, they would fish primarily on the drift throughout the night, as the species is essentially nocturnal spending the daylight hours lying dormant deep below the surface. With the onset of dusk they ride towards the surface feeding mostly on squid which, also rise towards the surface at night to feed. 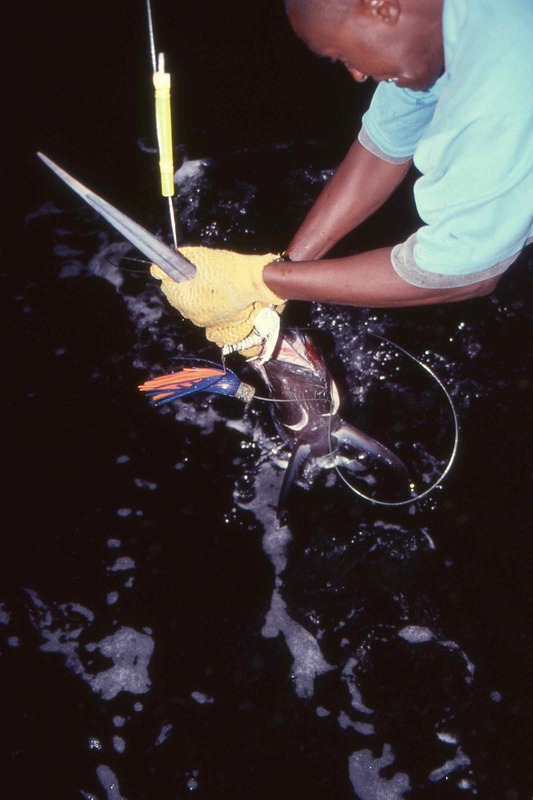 Not surprisingly squid was is the main bait used to catch broadbill, though fish are also caught on strip baits cut from the belly of small tuna and dorado, which are rigged with chemical light sticks that act as visual attractors. Tagged sailfish ready for release, Kenya is one of the worlds great sailfish destinations, I have caught as many as 16 in a single days fishing there. 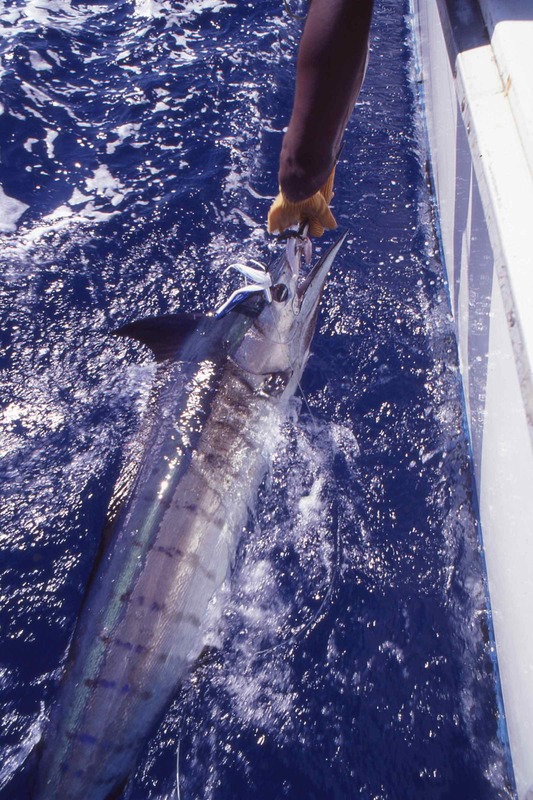 When most boats drift fish the baited lines were simply lowered over the side of the boat, and set to fish at various depths using weights and balloons. Some crews fished their baits much deeper in conjunction with downriggers, going to great lengths to cover each hook in soft wool to prevent the fish detecting the steel with its sensitive bill. 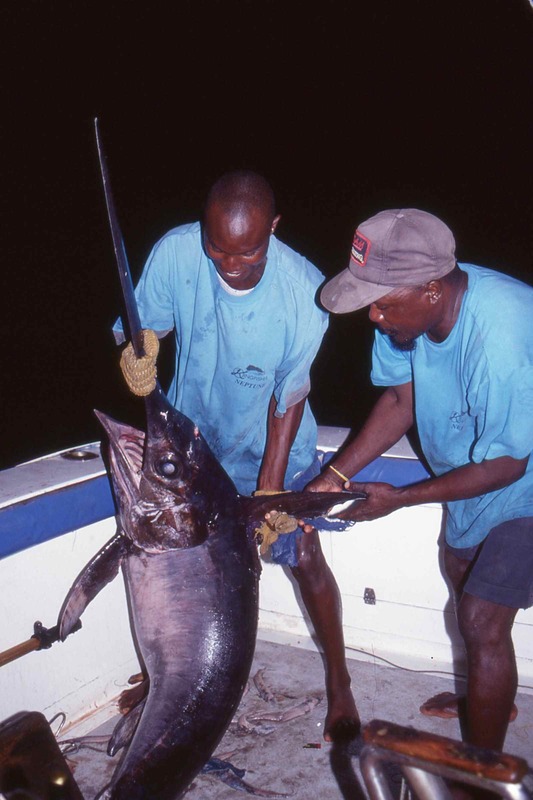 Then a few of the Kenyan boats which had pioneered this fishery discovered that trolling a spread of baits at night produced substantially more takes than drifting. 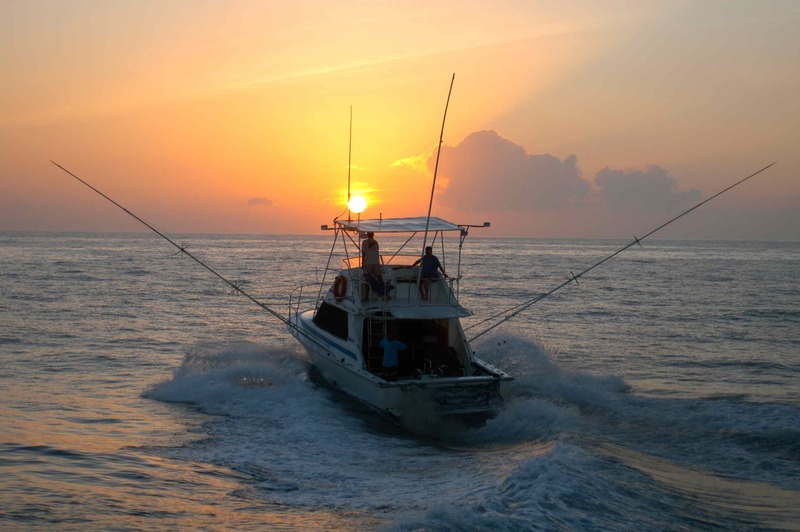 Typically they would fish three lines, one set to work off the dowrigger set between 50-100ft, and two others fishing on the surface set at various distances in the boats wake off the outriggers. With baits the baits out the boat trolls very slowly, waiting for a strike. The boat must fish in total darkness, broadbill are easily spooked by light. When trolling for broadbill the reels are set with a light to moderate drag setting with the ratchet on, and as soon as a fish strikes a bait the angler must quickly grab the rod and throw the reel into free-spool. This allows the fish time to eat and fully swallow that bait without feeling the resistance of the line, though some takes are unbelievably aggressive, with the ratchet screaming out loudly as the fish snatches the bait and runs away with it. In this instance there is no need to free-spool, unless the fish drops the bait in which case it may return, you simply push the lever drag forward to the strike position and firmly set the hooks. We had left Malindi early in the morning, running in a north easterly first towards Mambrui then onwards to Raz Ngomeni, all of the time heading further offshore into deeper water, bluer water. After an hour Angus had throttled back to 7 knots trolling speed, the crew set our lines, and we started fishing our way out to the banks. That first days fishing had been about as frustrating as fishing gets. 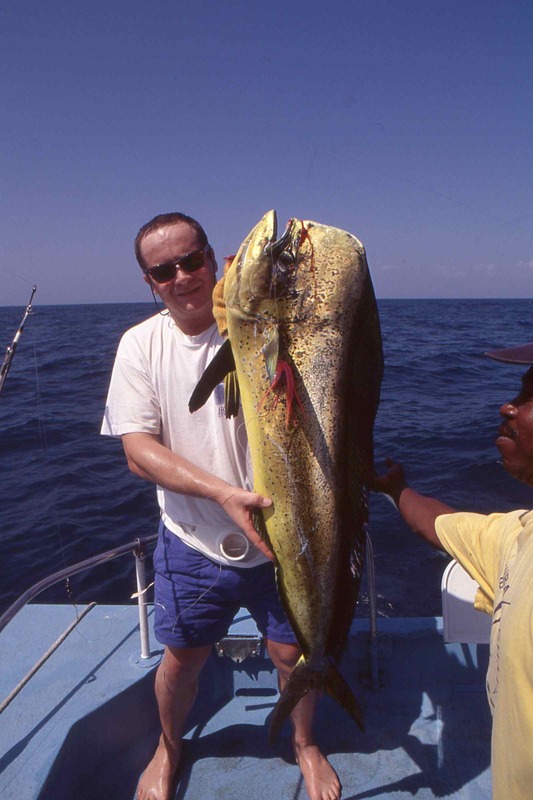 Apart from an action packed half an hour catching dorado along the edge of a weed line, fish we needed for both fresh bait and that evenings supper, we caught very little. A little after midday a big blue marlin had taken a swipe at a lure fishing off the starboard tag line, emptied about 100 yards of line from the reel in a few brief seconds, then thrown the lure high in the air in a head shaking tantrum on the surface. Later I had experienced a crazy hour trying to hook one of a half dozen seemingly unmissable shots at sailfish, without success. The fact that Angus and the crew also missed a few strikes and had reassured me by telling me that recently the sails had often been particularly difficult to hook did not make me feel any better. I was starting to think that picking the ‘thirteenth’ of March to fish had somehow been a big mistake! Hours later was I sitting watching the sun fall and finally disappear in the western sky, following allowing the sudden onset of darkness, which is so much a feature of equatorial latitudes. The crew prepared for the nights broadbill fishing. 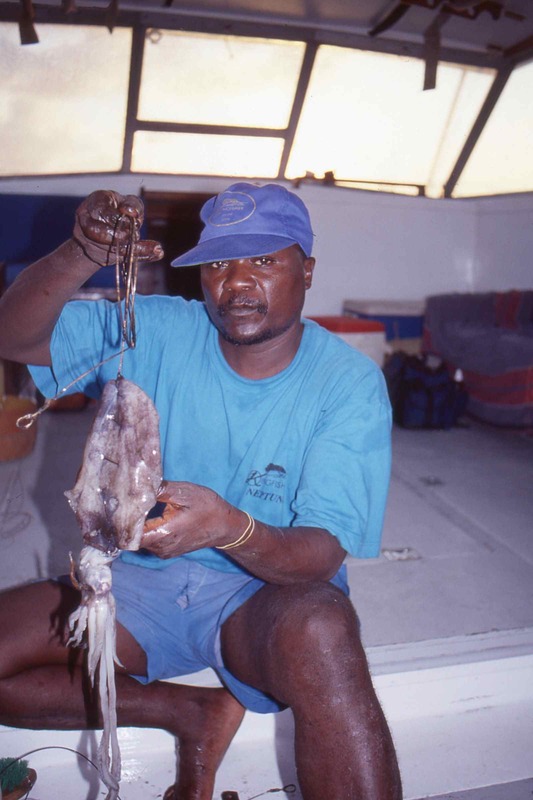 Saidi had rigged the huge squid baits with the precision of a surgeon, skillfully sewing all but the very points of the hooks into the body of the squid. Festus concentrated on the rods and reels, checking clutch settings and ensuring our supply of chemical lights were ready for use. Charo disappeared into the galley with a fat dorado, from where a rich aroma of fried onions and delicious spices soon floated out to drift around the cockpit. That was one of the finest fish dinners I have ever enjoyed. By seven O’ clock it was pitch black, a perfect night for broadbill, the darker the night the better the fishing as even modest levels of moonlight are sufficient at keeping the broadbill well down from the surface. Tonight the moon would not rise until after four in the morning, and even then it would rank as little more than a token gesture at increasing light levels. It was a warm and balmy evening, there was little wind and hardly any swell, everything appeared to be perfect; almost too perfect. Sitting alongside Festus, who was supremely confident of success, I eventually began to relax and slip into one of those moods of total contentment and self satisfaction which come occasionally when fishing. Everything seemed right with the World, somehow I knew that success would shortly come; and it did. A little after seven thirty the ratchet on the 50lb class rod fishing off the downrigger screamed out aggressively. It was still screaming when a split second later I grabbed the rod, and as instructed I pushed the lever drag to strike and struck-once, twice, three times, and still line poured from the reel. Shark, I silently thought to myself-I’d caught plenty fishing at night in the past, but just then one of the crew pointed at the neon streak of my light stick scorching across the surface several hundred yards away-not a shark, a broadbill! With the realisation that finally I was attached to one of the most sought after species of fish which swim, a fish I had wanted to catch for many years, and knowing that a high percentage of hooked fish are inevitably lost, my new found confidence ebbed as quickly as a falling tide can empty a shallow bay. After the first blistering run across the surface the fish dived deep, and despite working in all but total darkness I could feel the difference in pressure and the direction of pull on the rod. The crew kept a watchful eye on the angle of the line shouting up to Angus sitting high above in the blackness as it changed, allowing him to carefully reposition Neptune’s stern and prevent the line from getting fouled. 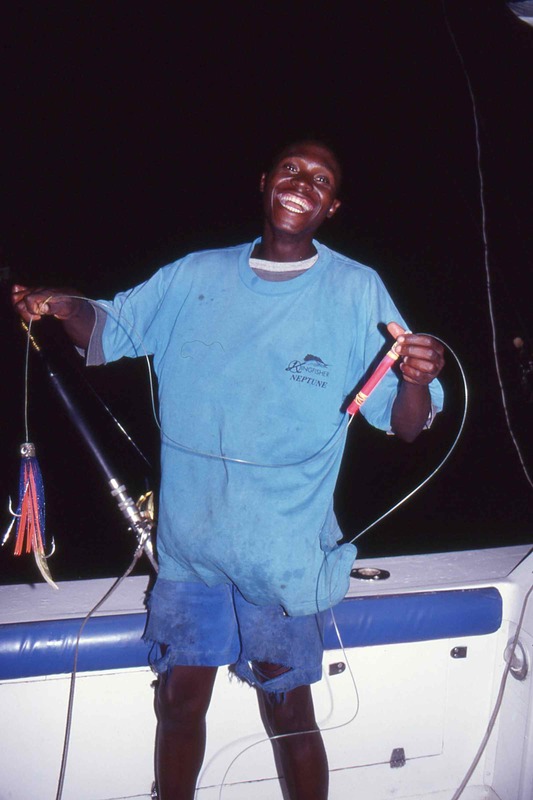 Eventually we could make out the glow of the light stick deep below the surface, but that fish was certainly not planning on coming to the boat easily, and made several more powerful dives before Festus first managed to grab the leader. When we got her aboard her flanks glowed an iridescent, deep purple in the reflected lights of the cockpit, and Angus conservatively estimated the weight of my first broadbill as being 120lb. She was fat, very fat, stuffed literally to the gills with small fish. When weighed the following day over 20 hours later, obviously after loosing a considerable amount of weight, she registered 47kg-that’s 103.4lb , a nice fish but small for a species that when mature exceeds 1000lb. With one fish successfully landed we were jubilant, and I barely had chance to sit back and reflect on my success before the next fish hit. Instantly I could feel that this fish was much bigger, I was all but helpless to resist as an estimated three hundred yards of line emptied off the reel, then suddenly all went slack. In comparison with other billfish broadbill have a very soft mouth, already I had been told that many times the hook pulls free. The best technique having hooked a fish is to ease back on the drag to minimise yet not eliminate the pressure on the hook, its a fine line between success and failure, and new to me. I lost the third and forth strikes too, before my second broadbill was successfully tagged and released, a chunky little fish of about 50lb. Broadbill are a strange looking species of billfish, with the characteristic wide bill from which they get their name accounting for approximately half their total body length. The other noticeable feature are their huge, ebony, black buttons of eyes, firm evidence that these are a deep dwelling, nocturnal species of fish. Later that night my third and last broadbill was tagged and released, at about 25lb the smallest of the three. With the break of dawn we once again switched to regular trolling, and it was not long before the first sailfish proved as difficult to hook as those the day before. Then, just as the first heat of the day was starting to force beads of sweat and a craving for cold drinks, I hooked a fast running billfish on a strip bait. Blue Marlin! shouted Angus as the fish exploded fully 15ft into the air in the first of an amazing series of grey hounding jumps across the ocean. In truth I had expected it to jump free such was the frequency and aggression of those jumps, but the line stayed tight and about fifteen minutes later an exquisitely marked little blue marlin estimated at 120lb swam away sporting a bright orange dart tag, back into the blue depths of the Indian Ocean. It was time to start running for Malindi, the perfect ending to a magical trip.